I recently received a mail from the online Second Hand – Shopping Bazaar –SHOPnPICK asking me to promote their site on this blog. I want to say at the outset that I do not have any experience dealing with this site and also that we at the blog are not receiving any compensation for this article. As we have all noticed that buying and selling second hand products have been a part and parcel of Manipal students’ life. Merely a walk on the Manipal roads can reveal the large number of hand-made fliers showcasing second hand cars, bikes, furniture etc. are being posted on Dollops, KMC Greens and other Manipal walls. SHOPnPICK is an online initiative to make it easy for the students to buy and sell second hand products. Using the website and all its services is absolutely Free! Here’s an overview of their campaign in Manipal – http://www.facebook.com/album.php?aid=41218&id=169931469685665. The best part is that SHOPnPICK is easy, free and builds up a direct interaction between the second hand buyer and seller with NO third party interference or commission factors. So, students hugely benefit as they don’t have to become a prey in hands of these second hand showroom third parties cropping up in Manipal every now and then. 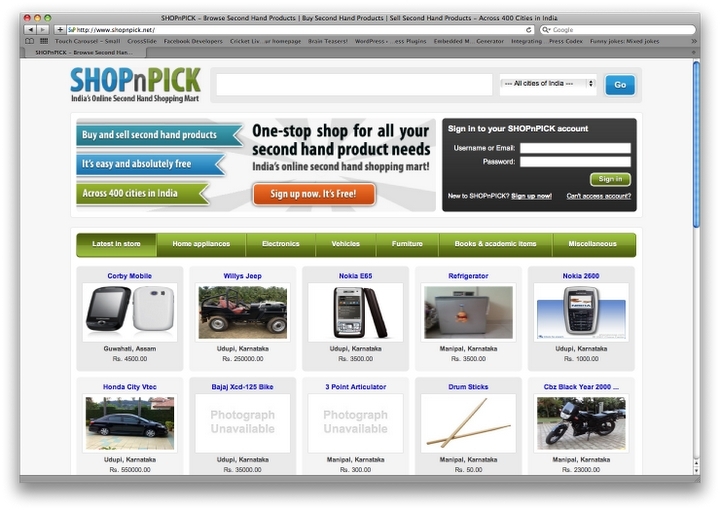 SHOPnPICK website is a complete Manipal student initiative which is and will remain free. SHOPnPICK also has a Twitter channel where users can get updates on the latest second hand products in store.